A quarter of a century ago, San Antonio built the Alamodome. The city was able to get support for the funding for the venue in part because of local dreams of hosting San Antonio’s own NFL team. Aside from a few New Orleans Saints “home” games after Hurricane Katrina, that dream hasn’t come to pass. But another professional team will kick off its first regular season in the Alamodome on Saturday. 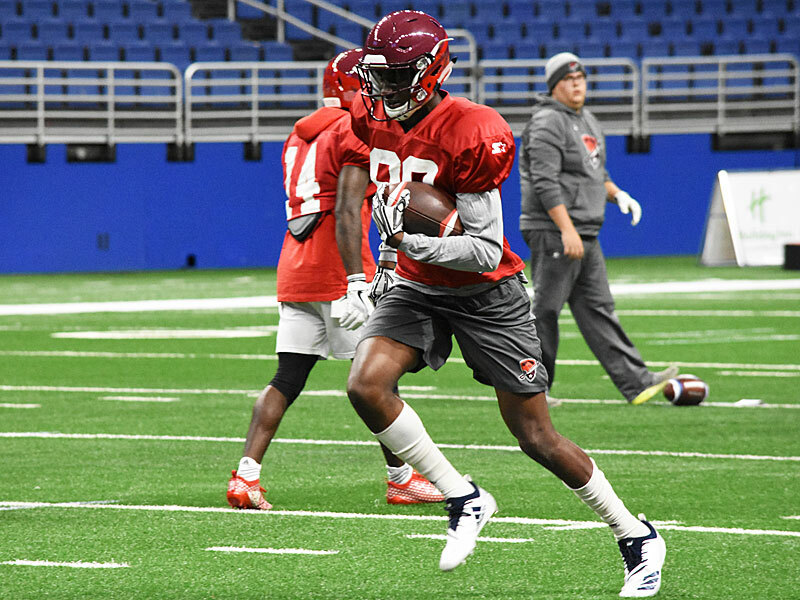 The San Antonio Commanders of the fledgeling Alliance of American Football have a 52-man roster filled with young players who have their own NFL dreams. The independent AAF is not officially an NFL minor league, but it is loaded with players who were cut from NFL training camps and a few who even have real NFL game experience on their resumes. The league is also run and staffed by coaches who have NFL or major college experience. The Commanders’ roster was put together in large part by general manager Daryl “Moose” Johnston, who gained NFL fame as a tough blocking fullback who was part of three Super Bowl champions with the Dallas Cowboys in the early ’90s. The three quarterbacks on the Commanders’ roster have all been around big-time football. Woodside set passing records at the University of Toledo and spent time with the Bengals. Dustin Vaughan from West Texas A&M went to training camp with the Dallas Cowboys. Marquise Williams from North Carolina was with the Green Bay Packers and later played in the Canadian Football League. Commanders kicker Nick Rose saw NFL action as recently as a few weeks ago. Rose spent one week with the Los Angeles Chargers, handling the kickoff duties in their final playoff game against the New England Patriots. Rose was in practice with the Commanders at Central Catholic High School on a Tuesday, spent that weekend in the NFL, and then was back with the Commanders the next week. The AAF also took a regional approach to building its eight teams. The Commanders have 19 players who are from the state of Texas. That includes San Antonio native and former Madison High School star Aaron Green. Former UTSA wide receiver Josh Stewart and Incarnate Word punter Joseph Zema are also on the roster. San Antonio has a long history with non-NFL teams. Commanders head coach Mike Riley was part of one of those in 1991 and 1992. He was at the helm of the San Antonio Riders of the World League of American Football, which was owned by the NFL. The Riders were expecting to move into the brand spanking new Alamodome, but the league left the U.S. market before San Antonio’s new stadium was completed. Riley took a team into the Alamodome once before when he coached Oregon State and the Beavers played in the Alamo Bowl. Riley finally plays his first home game in the Alamodome on Saturday. The game will have a few differences from what NFL fans are used to seeing. First off, the season won’t kick off with a kickoff. The AAF will not have kickoffs – a move to cut down on injuries. Drives will start at the 25-yard line. There will still be special teams in terms of punts and field goals. There will not be point-after-touchdown (PAT) kicks. Instead, teams will go for two-point conversions—upping the number of fourth-down-and-short type plays that teams need to include in their offensive preparation. The pace of play will be quicker with a shorter play clock (35 seconds vs. 40) than in NFL games. The league has cut back on TV timeouts to shorten games. The AAF has a national TV footprint. Teams play a 10-game regular-season schedule, followed by two weeks of playoffs. The Commanders’ opener will be on CBS. Later games will be on the CBS Sports Network, the NFL Network and Bleacher Report Live. There will also be local radio on ESPN San Antonio (AM 1250) and some local TV on KMYS (CW35). Ultimately, there will be running, passing and tackling by players who dream of making big plays and winning titles. There will be home teams and—the league hopes—lots of cheering fans.